Robert Pope at the finish line. 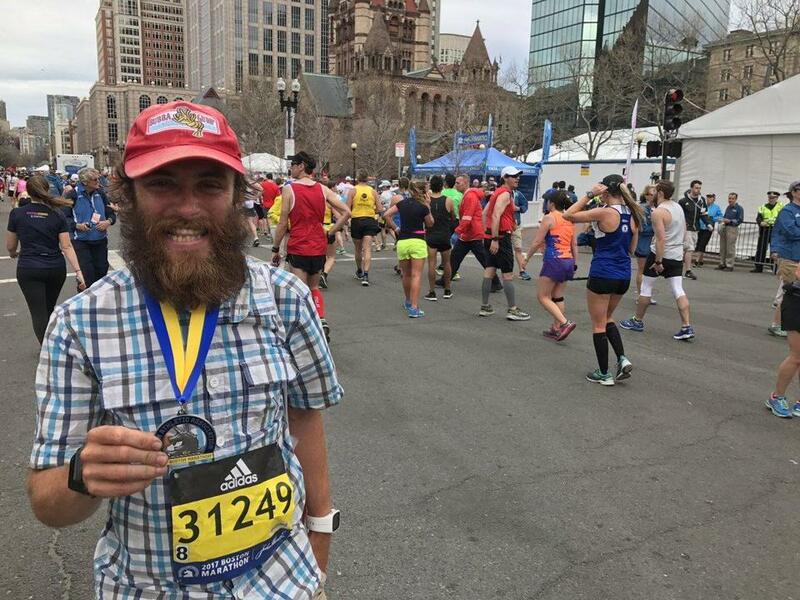 Robert Pope, the Liverpool, England, native who has spent the last few months running across the country to retrace the route traveled by ”Forrest Gump,” tacked on an extra 26.2 miles to his journey when he crossed the finish line on Monday during he 121st Boston Marathon. Pope, who is raising money for two charities, arrived at Boylston Street around 2:21 p.m., finishing the race just shy of three hours, an impressive feat for someone who has traveled more than 5,000 miles by foot in the past seven months. Pope, who channeled his inner Gump by growing out his beard, and wearing Gump’s signature white Nike shoes and checkered shirt, said he was fueled on Monday by the intensity of the crowd. People shouted “run, Forrest, run,” as he worked his way to the finish line, he said. ”The crowds have so much energy,” said Pope. 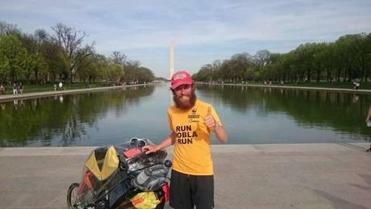 Robert Pope is retracing Forrest Gump’s memorable route across the country, and making a pit stop in the city for the big race on April 17. One person even handed him a beer as he navigated the course. This was the second time Pope has run the Boston Marathon. His first race in the city was in 2006, he said. Pope is in the middle of a personal project, copying the path across America that was made famous in the award-winning 1994 movie starring Tom Hanks. Pope put the trip on pause so he could take part in the marathon. He left off in New Jersey, and plans to return there this week before then running back up to Boston, on his way to Maine. He invited runners to join him when he passes through Massachusetts next Sunday, just as Gump had supporters running alongside him in the film. ”People can run, or just come and have a beer,” he said.